Admire the largest and most sacred of Bali's Hindu temples at Besakih Temple, an important place of worship and an example of Balinese architecture. Situated in an impressive mountainous landscape, the main temple presides over an attractive vista, giving opportunities for photographs of its protruding decorative steps against a captivating natural backdrop. Consider hiring a guide to discover more about the temple's history, and to find the quieter places at this very busy attraction. Be prepared for locals trying to convince you to buy something; some can be quite insistent. Work out when and for how long to visit Besakih Temple and other Karangasem attractions using our handy Karangasem driving holiday planner. Accompanied by our guides, we enter this 22 temple complex located on the slopes of the volcano Agung. It was certainly one of the best of all Bali. The day came, sunny, and can see the top many times and accenting the vivid colors of grass and exotic flowers to feet and stairs of the temples. An unforgettable day without a doubt! The temple grounds are very beautiful. I suggest looking up your own search on this place to truly learn what’s going on. Try and come during a non-cloudy day to get the best views. Local guide will probably try and ask for more money with other ladies shoving things in your face. The best place for praying. It has many 'padarman'. This temple's more neat than 7 years ago, the last time i came here. Temple area is nice, but it is not worth 60.000 rupiah. In the price included is a local guide. Our didn't know a lot about the place and could give us just very basic information. Plus, at the entrance they already told us they expect that we give extra tip for the guide?! In the price included is a one way transportation, which is unnecessary and you can't buy a ticket without transportation. The way up to the temple area is a shop alley and everybody is asking you if you want buy something. Absolutely amazing. We had the best tour guide who really gave us an in-depth explanation of Bali's Hindu culture. Be warned, even if it is cloudy you will get sunburned. Every day, we help thousands of travelers plan great vacations. Here are some tips on how to use your Listing Page to attract more travelers to your business - Besakih Temple. Promote your permanent link - https://www.inspirock.com/indonesia/karangasem/besakih-temple-a819240427 - on your website, your blog, and social media. When a traveler builds a plan from this page, the itinerary automatically includes Besakih Temple. 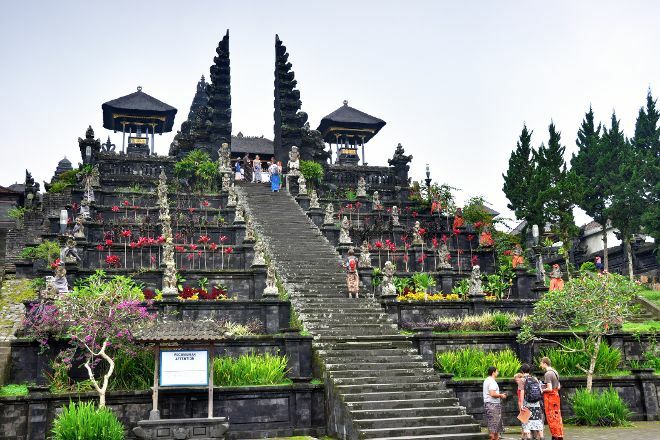 This is a great way for travelers looking for a great vacation in your city or country to also experience Besakih Temple. Promoting your link also lets your audience know that you are featured on a rapidly growing travel site. In addition, the more this page is used, the more we will promote Besakih Temple to other Inspirock users. For best results, use the customized Trip Planning Widget for Besakih Temple on your website. It has all the advantages mentioned above, plus users to your site can conveniently access it directly on your site. Visitors to your site will appreciate you offering them help with planning their vacation. Setting this up takes just a few minutes - Click here for instructions.